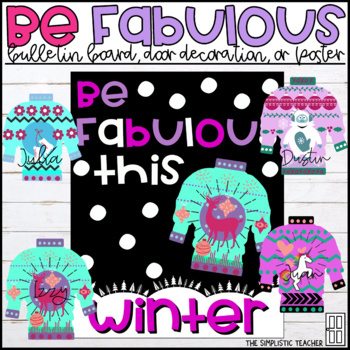 While these can take on the theme of ugly Christmas sweaters, the main message here is to be bold and fabulous this winter to students. Because I just couldn't resist, I've included two sweater versions, which make the cutest classroom bulletin board, door decor, or hall display! 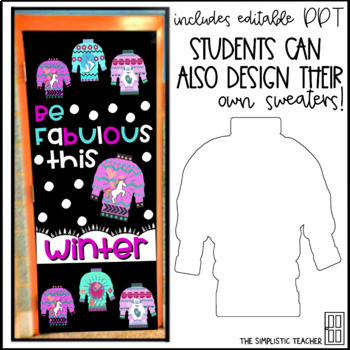 You can also have students design their own on the included blank sweaters, in three different sizes to fit your needs and have them post this around this product! This can be a bulletin board, a poster, (if you choose to print it), or great for your door, as it comes in two options for buyers...either enlarge it, OR put it together yourself! Both results are super cute! Be sure to read my printing tips in the PREVIEW and what's included before purchasing! Thank you! (18x24, 24x36, and 36x48) should be engineer printed to make a huge impact in your room! 2. Directions on how to make an engineer print included (costs about a medium espresso, but SO WORTH IT! Fa La La La Llama-Llama themed-super cute!